I was invited to show new work at Anne & Mark’s Art Party, along with my colleagues in Santa Cruz Woodworkers. It is described as an occasional and irrational art fest, and the opening gala is September 24. 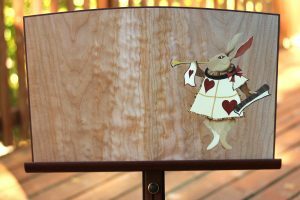 The theme is taken from Alice in Wonderland, so what better place to unveil my new White Rabbit Music Stand! Anne & Mark’s Art Party takes place September 24 through October 1 at the Santa Clara Fairgrounds. Check their website for more info. Hope to see you there.